General Characteristics: Tall, erect, stocky, maturing within 9 to 12 months, producing from 5 to 10 oha; recognized by purplish marginal veins on leaves and greenish edges of purplish-black petioles. Petiole: 100 to 140 cm. long, purplish-black with fairly distinct light green edge, a dark red ring at base with light pink for 1 to 2 cm. above. Corm: Flesh white, tinged with pink especially near the apex, with yellowish fibers; skin light to brilliant dark pink and occasionally purple along leaf-scar rings. Inflorescence: Peduncle purplish-black; spathe 30 to 35 cm. long, usually curved and drooping, the lower tubular portion 5.5 to 6 cm. long, dark reddish-purple, the upper portion orange with reddish-purple margins, usually tightly rolled but sometimes slightly open near constriction. Origin, and derivation of name: Native variety; the descriptive name Eleele refers to the purplish-black color of the petioles and the suffix omao to the light green edges. Distribution: Planted fairly extensively in the uplands throughout the islands but especially so in Kona, Hawaii. 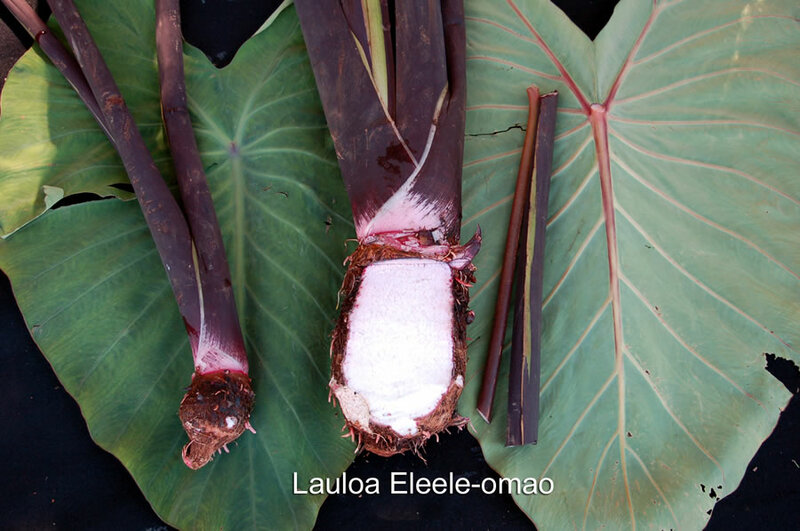 Remarks: This variety resembles Lauloa Eleele-ula so closely that at times it is practically impossible to distinguish the two. Although the outward appearance is almost identical, the quality of poi made from Lauloa Eleele-ula is far superior to that from this variety. The two varieties may be differentiated by the greenish edge and continuance of the petiole color into the leaf veins of Lauloa Eleele-omao in contrast to the more pinkish edge and the changing of the dark petiole color to a yellow green just below the apex of Lauloa Eleele-ula.